April 4, 2018 | Alexandria, VA Veteran Enterprise Solutions, Inc. (VESI), a leading information technology solutions provider, has announced its acquisition of VetsAmerica Business Consulting Inc., an IT firm based in South Carolina. 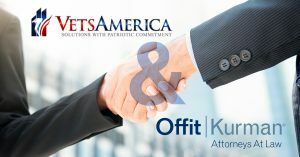 Offit Kurman Business Law and Transactions attorneys, Michael N. Mercurio and Brent Salmons, represented VetsAmerica, the seller, throughout the acquisition. Both organizations are certified Service-Disabled Veteran-Owned Small Businesses (SDVOSBs) that have contracted with numerous federal government agencies. VetsAmerica was founded in 2002 by John E. Collins, a Vietnam service-disabled veteran and recipient of the Navy Commendation Medal with Combat “V.” In the 16 years since, the company has earned a reputation as a first-rate IT services provider for the federal government, garnering spots on the Washington Technology Fast 50 and the Inc. 500. Through its sale to VESI, VetsAmerica joins a fast-growing technology solutions company with a workforce comprised of 42% veterans, many of whom are service-disabled veterans. VetsAmerica is the second privately held business successfully sold by Mr. Collins. “It was an honor to work with Mr. Collins and VetsAmerica to assist with the VESI transaction. I find it rewarding to work with veterans to satisfy their objectives and, in this case, facilitate the successful sale of VetsAmerica. ” said Michael Mercurio. Mike Fisher and Rock Hall Partners served as the sell side M&A advisor to VetsAmerica for this transaction. Offit Kurman offers comprehensive legal services for individuals and organizations seeking to grow their businesses during every stage of the business lifecycle. The firm has successfully advised and represented government contractors and other private business clients in formation, contract, compensation, and finance and capital matters, as well as ownership transitions through mergers, acquisitions, and other transactions and agreements. With offices throughout the Mid-Atlantic, Offit Kurman is well-positioned to meet the needs of dynamic government contractors in Virginia, Maryland, and surrounding regions.